WBC runs on the volunteer efforts of your fellow gamers—from the GMs that run the events to the support staff that does all the behind-the-scenes work to your unpaid Board of Directors that calls the shots. The CD is your sole full-time employee. WBC will draw over 2,000 people—the vast majority of whom will never give a second thought to participation in any way beyond their attendance. Barely more than 10% will take a moment to vote in our elections. Yet, those few manage to make it happen year after year on the backs of the same tried and true hobby stalwarts. Our Hobby Service Award is devoted to recognizing the efforts of the best of the best with an annual moment of recognition for their selfless participation. Twelve Service nominees are put forward each year by the Conference Director for the Board of Directors’ consideration. Although Games Master duty is the most common qualifier, it is not the only factor, with consideration given to other unseen volunteer tasks and this year’s honoree again is well versed in that regard—having never served as a “GM” himself—but instead serving his time in the Junior’s Room—where disputes are settled at ankle level. The Board votes by secret ballot, weighing their votes according to their own individual values as to what constitutes the greatest contribution, by ranking each nominee from 12 (strongest) to 1 (weakest). Our winner scored 82 of a possible 96 with three firsts and two second place votes and no scores in the bottom half of the poll. He bested the runner-up by 14 points to win comfortably—if one can win comfortably after waiting 25 years! It is our volunteer base that has made this convention such a success. I still recall the original organizational meeting at the Penn Harris in 1991 when this individual spoke to the crowd and volunteered to host Juniors events to help support the hobby. He was true to his word and is still at it 25 years later—the only person to have performed that thankless task 25 years running. He may also be a little stubborn at times. This year will be his 25th consecutive running of the Up Front gauntlet without success—but he’s still on his feet and back for another try—even if his son has beat him to the grand prize. By itself, that 25 years of service to our youth should be enough for this award—and sainthood too. But Ray’ Stakenas’s service goes well beyond that. Most significantly, he has contributed directly to the growth of the hobby by raising two children who have become active members in our community. The first, present here today, is a manager of a Games Workshop store out in LA. The other, an artist, has done work for companies such as Rio Grande—including cards for one of the Dominion sets. If that doesn’t constitute helping grow the hobby, I don’t know what does. He also hosts Roman themed gaming sessions for a high school group of Latin students. And if that still weren’t enough, I also believe he serves as a true ambassador to our hobby—representing the best qualities of competition and sportsmanship in every game he plays. A prized member of the BPA extended family whose recognition is long overdue. Ray Stakenas, Sr! Stuart Tucker (2005): Stuart is a past Board member who has always shouldered at least one GM burden every year; often doubling up to handle an orphaned event as well. Under his direction, Hannibal has prospered in a Pre-Con slot and he is largely responsible for the success of the Winter Activation Meeting mini-con. He may be better known for his role as the Happy Handicapper who posts the odds and commentary for our Team Tournament event. Lastly, he originated the Laurels concept that drives all of the Caesar and other metagaming secondary features of WBC. No wonder he led all the nominees in votes! Kathy Stroh (2005): Kathy is also a past Board member who could always be counted on to volunteer when a job needed doing. She headed the Juniors program at WBC long before there was a WBC and remains active as a Juniors GM today. Gender issues don’t bother Kathy—she’s a regular at the Enlightenment mini-con and has long competed there as the sole female in attendance. Steve Okonski (2005): Steve is the guy behind the scenes who gives BPA its public face to the world—working hard to organize our ever growing website. His programming skills have also fathered the Personal Scheduler which is a true boon to WBC veterans plotting out their daily schedules. Many of the photos gracing our website have come from Steve’s camera in the years he’s been able to attend. An ardent rail game buff, he has been active helping to run Rail Baron and Empire Builder and is also a winner of our Sportsmanship Award. Quite a resume. Vince Meconi (2005): Vince is the epitome of a professional GM. His vibrant War At Sea tournaments just get bigger and better every year despite being long out of print. He was the first GM to publish extensive statistics pertaining to his tournament. His players know that they will be provided plenty of post-event coverage direct from the horse’s mouth every year. Not coincidentally, Vince always ranks highly in the GM of the Year balloting. Mark McLaughlin (2005): Mark really is the epitome of the enthusiastic volunteer. He’s never had a child attend WBC but every year he runs Princess Ryan’s just for the kids on Saturday morning. And every night he runs Napoleonic Wars for us big kids. Not a tournament kind of guy, Mark is unusual in that he doesn’t play in his event except as needed to round out a table. But that doesn’t stop him from buying a round for the finalists and toasting the emperor. Ken Whitesell (2005): Ken stands out in a crowd. Even without his hat adorned with his bonafides—badges from every Avaloncon/WBC—the 6’ 5" WBC bouncer doesn’t often sneak up on you. The founder of the Tontine society for veterans of all Avaloncons/WBCs, Ken is responsible for those WBC Legion XV additions to our Badge holders that all the in crowd is wearing. Ken has always taken on the dirty jobs that no one else wants—like acting as security in our non-obtrusive honor system badge police. He also volunteers for whatever event is orphaned in the waning days of the scheduling - foregoing the pleasure of running a favorite game for whatever happens to be needed. The big lug is really a softie at heart. Keith Wixson (2006): Keith garnered 68 of a possible 96 votes for the honor from a strong field whose dozen scores ranged between 26 and 68. Keith is widely considered one of the best GMs at WBC where he has long been active in the CDW field and is known particularly for his strong support of Wilderness War which he backs with an assortment of unique period weapon replica prizes. His service to gaming in general and BPA in particular is also noted with his strong stewardship of quality PBeM tournaments and as a reliable fixture behind the Winter Activation Meeting mini-con. Bruno Sinigaglio (2007): Bruno garnered 69 of a possible 96 votes. Bruno is almost single-handedly responsible for the Grognard Pre-con, where he GMs all eight events until the WBC "day" shift arrives to take over later in the week. Even then, his hand is clearly the driving force in completing the paperwork for many of these events. He also runs several BPA email tournaments for the classic hex wargames and is largely responsible for their continued survival at WBC with his GM-intensive flexible format scheduling, which is accomplished at the cost of his own laurel chances. He stepped out of grognard character to Sponsor Queen's Gambit, a perennial favorite at WBC. Debbie Gutermuth (2008): Debbie gardered a record 73 out of 96 possible votes.Not just another suffering spouse who makes the best of her husband's weekly vacation, Debbie is one of the organization's hardest working volunteers. She starts her week with the CABS crew running the Auction and works deep into the night on the financial payout that makes our Games Auction one of the very best in the hobby. Aside from taking a turn as a GM every year, she also combines her other hobby interest—photography—to take literally thousands of photos annually to document each and every event as the official BPA photographer. Her photos grace the results pages of virtually every event on our website.Winner of her share of events, one wonders how many more plaques she'd earn were she not constantly working the camera all week. Even long after WBC ends, she labors on the editing of those photos to illustrate our web coverage and create A WBC highlight "movie". Alan Applebaum (2009): Alan was the BPA’s first Chairman of the Board and did yeoman’s work keeping the email meetings humming back when we weren’t so much on automatic pilot and controversy was more commonplace in the fledgling days of the organization. He also supported BPA financially both from his own pocket and with pro bono legal work from his lawfirm which enabled us to get our trademarks. His advice and calming manner during sometimes raucous Board meetings was invaluable and he was often the first to sacrifice his own position in favor of a workable compromise. He never took things personally, got upset, or had to have things his own way. Alan was a consumate professional whose absence from the Board has been dearly missed. 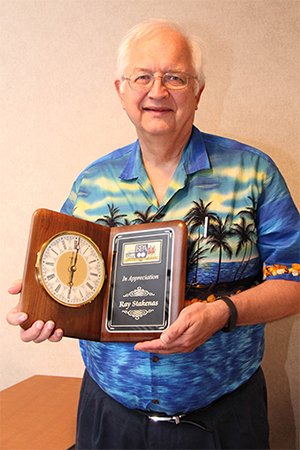 However, he remains active in the hobby and those who play in the Victory in the Pacific or War At Sea tournaments benefit from his largesse every year while employing the chess clocks he donated to those events. Alan exacted his last revenge on me by finishing deadlocked at 72 points for the award, rather than winning it outright. Consequently, the tie breaker vote fell to the CD. I’m sure Alan would have enjoyed the irony of my being required to vote and watching Don Greenwood squirm while making the choice between two deserving recipients. Well, the joke is on him. Don chose him. He who laughs last, laughs best. David Dockter (2010): In 2010, the award went to someone on the list for the first time. With a record tying 73 points (out of a possible 96), he polled no lower than 7th place support from the Board while being named in the top three slots by half the BoD. Those of you who frequent Consimworld or Boardgamegeek will recognize him as one of WBC's most vocal supporters—augmenting his praise with entertaining statistical analyses of events to support his tireless proselytizing. He was one of the original founders of the Winter Activation Meeting mini-con for Card Driven Wargames. A shark in his own right, this competitor currently ranked #24, has few peers among his fellow sharks when it comes to doing more than just competing. His enthusiasm is infectious and just a tad zany—witness this year's Sandman Salute celebrated beneath a fez cap at the Good Spirits Bar on Thursday night to commemorate those with sixth place WBC sand plaques. We now owe him for the creation of yet another WBC tradition. His support of the Team Tournament with humorous team logos for all comers has kept us amused and whetted our appetites for the upcoming festivities each summer. Above all else, Dave Dockter is just one of those guys who makes you want to come back to WBC each summer to share some vicarious boardgame adventures with a guy you wish you could play every weekend. Scott Pfeiffer (2011): In 2011, the vote was unprecedented. Understanding that a typical Board vote would probably favor the sun setting in the west by only a 7-2 margin, it was surely a sign of the coming apocalypse, when they—by secret ballot no less—unanimously selected Scott Pfeiffer as the 2011 recipient of the BPA’s Hobby Service Award.This individual has never been a WBC GM. However, he has been active in creating and supporting one of the hobby’s strongest clubs in his hometown of Greenville, SC, and was instrumental to the birth of WBC. While I often get the credit (or the blame) for transforming Avaloncon into WBC, it really was the creation of this man who convinced me to take the leap back in 1998 when Avalon Hill went down the tubes. And while many may claim to say the right things to support their hobby, few have actually backed that up with action. It was Scott Pfeiffer who actually took the bull by the horns and incorporated BPA pro bono with his law practice, writing our by bylaws, and performing the myriad tasks required to keep us on a solid legal footing. While so many of us escape the annoyances of the real world to enjoy ourselves each August extending our Peter Pan syndrome of never growing up with these addictive games, it is Scott who invariably pays the price behind the scenes in an adult world when I need to pull him from a game to deal with the legal issues of maintaining order when someone needs their priorities rearranged. Rest assured that while you’ve been rolling dice, Scott has been protecting your ability to do just that during this prized annual celebration of our hobby. This token thank you is long overdue. Keith Levy (2012): In 2012, only one nominee was listed in the top half of all eight ballots while garnering two firsts, two seconds and a third for a total of 80 points to outscore the next highest nominee by ten points to win the vote handily. In truth, were it not for an agreement by the Board to disqualify its own from consideration for such honors, I suspect we would have selected him long ago. In choosing our latest honoree, the Board has reached into the ranks of its recent past to select one of its own. During his time on the BPA Board of Directors, his votes were among the least influenced by his own particular gaming tastes and he could be counted on to always do what was best for the hobby as opposed to his particular interests. During spirited debates, he could usually be found on the side of compromise. Outside the Board, he was instrumental in time-consuming scouting and securing of locations for Euro Quest, WAM and our other mini-cons and was primarily responsible for the birth of Euro Quest and the Sampler Showcase. He is currently the primary caretaker of the BPA Game Library. As important as his contributions have been to BPA, Keith Levy has had an even bigger impact on the hobby outside our organization. He almost single-handedly built Games Club of Maryland into one of the nation’s leading gaming clubs, and did yeoman’s work in organizing conventions, gamer social functions and the GCOM Game Library. Nor did his enthusiastic drive and penchant for organization end there. Through Keith’s efforts, Reisterstown, MD now has a free public meeting place for up to 150 people with Baltimore County’s Public Recreation&	Parks for a regular family game night. Many people have left their mark on our hobby in one way or another, but none have been more selfless in doing so. Roy Gibson (2013): In 2013, only one nominee was listed in the top half of all eight ballots while racking up four firsts, a second, and a third to easily outdistance the runner-up by 15 points. Often in the top tier of this annual vote, this year no one emerged to deny him yet again. While he has served as a GM on occasion when I was in need of one and he proved too slow afoot to escape my reach, our honoree won his spurs completely behind the scenes without public fanfare or much in the way of credit. He also is one of my favorite targets in our too-infrequent gaming sessions and for some reason I cannot fathom takes great glee in returning the favor at every opportunity when the “Over the Hill” Gang meets in my basement. It is even money which one of us will keel over first loading/unloading the WBC truck in the July heat, but I’m betting on him. This tranplanted limey left his native Britain to bring his goofy accent and sterling work ethic to our shores, becoming a naturalized Yank and thereby enriching us colonials in more ways than I can count. Despite his highly questionable taste in friends, he is without a doubt one of the most selfless people I know in support of his hobby. Besides wasting countless hours keeping me out of computer-induced suicide, he helps with the aforementioned truck, takes time off to drive it to Lancaster, sets up the computers, prints our signs, and generally serves as my security blanket. I’d never have lasted this long without Roy Gibson .... truly one of the unsung heroes of WBC. If you enjoy this annual gathering, he’s one of the main reasons why. Bruno Passacantando (2014): Bruno Passacantando is a former Board member who earned our admiration and thanks for serving as our Treasurer for more years than I can recall and has been a regular since 1994. Bruno Passacantando volunteered his considerable expertise as a CPA—gained from years of operating his own firm—to safeguard our financial well being. If memory serves, he was around for the crucial early dealings with America’s favorite regulatory agency and navigating those hazardous waters is scary stuff indeed—even moreso given recent revelations about the IRS. If the tedium doesn’t get you, you’re liable to be crushed by a landslide of government regulations. Back then we even had something called “interest” income. If there’s a harder job than navigating the bureaucratic maze of government regulation, I’m not aware of it. He must have done a good job because we’re still solvent. In winning the award, Bruno scored 82 out of 96 possible points in our scoring system to easily out-distance the runnerup by twelve points. He earned three of the eight possible top votes and was the only nominee to receive more than one such accolade. At WBC, he can usually be found splitting his time between wargames such as Great Campaigns and Breakout: Normandy and just about all of the various sports tournaments—having earned laurels in most of them.